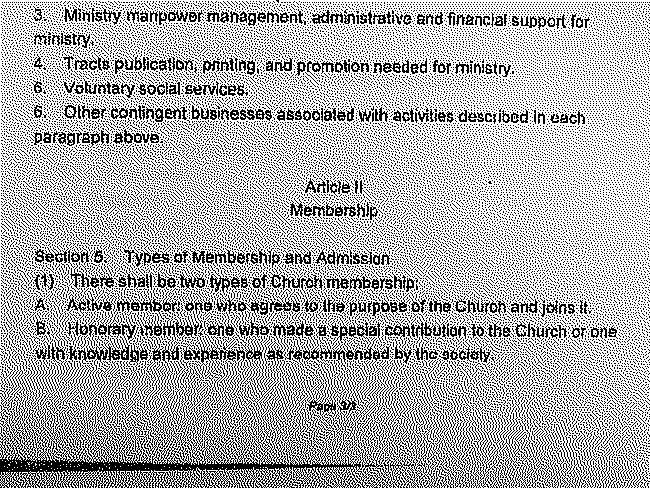 Included in the World Mission Society Church of God Bylaws submitted to the IRS as part of their application for tax exempt status, in information regarding membership to their organization. "Active Member. One to agrees to the purpose of the church and joins it." "Honorary Member. One who made a special contribution to the Church or one with knowledge and experience as recommended by the society...One who wishes to join the society shall apply by submitting a certain form for approval." I would assume that the active member is one who is baptized and agrees to follow all of the regulations of the church (passover, sabbath, etc). But who are the honorary members? What kind of "special contribution" does one have to make in order to receive this "honorary membership". Does salvation come with this kind of membership too? Second, according to Section 6 of their bylaws, members must pay dues. Are these the tithes? or freewill offerings? Interesting how they choose to include a no refund policy. 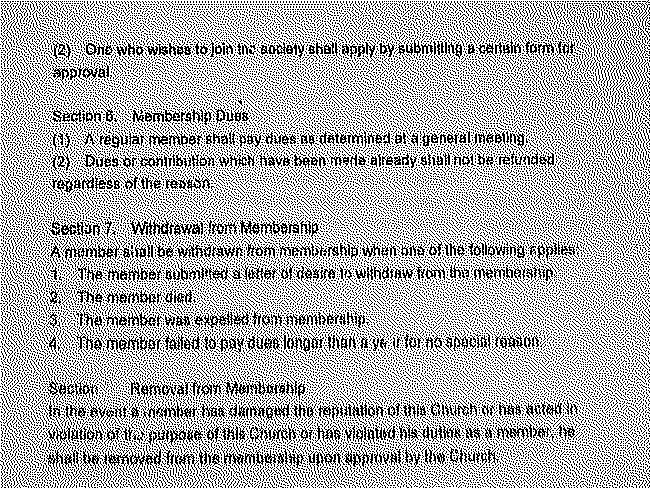 The worst part is that in Section 7 the WMSCOG admits that members will be "withdrawn" if they have not paid their membership dues for longer than a year for no good reason. If you ask WMSCOG members if they are required to pay certain amounts to the church, do they admit it? Do they admit that they kick members out for not paying?! The WMSCOG also kicks people out for "damaging the reputation" of the Church. That means that even if you say something negative about the WMSCOG, even if it's true, you get kicked out. The WMSCOG seems to go to great lengths to protect their image. Yet another characteristic of a destructive mind control cult. Sorry that was supposed to be 8613 Bunker Hill Drive, Southaven, Mississippi. Here's a great video of a presentation Prof. Ji Il Tark, who lectures on cultic groups. Besides that, I was pitched by a couple of WMSCOG representatives this past June. I listened for an hour or two. One of them sat across from me and made his case. The other stood the entire time and didn't say a word. The one who pitched me knew his pitch well, flipped back and forth through the bible where it lay on the table facing me, and cited and interpreted scriptures according to the theology of his church. His sole purpose then was to convince me of the heavenly mother theology. He didn't say anything about the heavenly mother and Christ having been rather recently incarnated. He talked for long stretches and stopped only at wide intervals to ask me what I thought. At the end of it all, he gave me his card. I haven't seen or heard anything more about them since then, except online.